Frrom the Fortnite video games comes the Drift action figure. 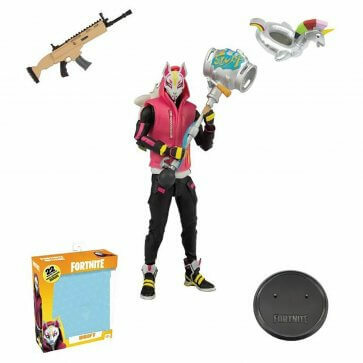 Drift is hyper-articulated with 22 points of articulation and includes a pool party back bling, legendary assault rifle and party animal pickaxe harvesting tool. The Fortnite Series 1 Drift 7-Inch Action Figure comes showcased in premium glossy Fortnite themed window box packaging.